In this modern fairy tale, a strong, brave maiden is invited to attend the prince's royal ball, but at the dance, she ends up finding true love in a most surprising place. "The prince is smart and strong,"
she confided in her mother. I see him as a brother." Her mother said, "Just go! And have a bit of fun. but you could meet the one." Once in a faraway kingdom, a strong, brave maiden is invited to attend the prince's royal ball, but she's not as excited to go as everyone else. After her mother convinces her to make an appearance, she makes a huge impression on everyone present, from the villagers to the king and queen, but she ends up finding true love in a most surprising place. This book is published in partnership with GLAAD to accelerate LGBTQ inclusivity and acceptance. 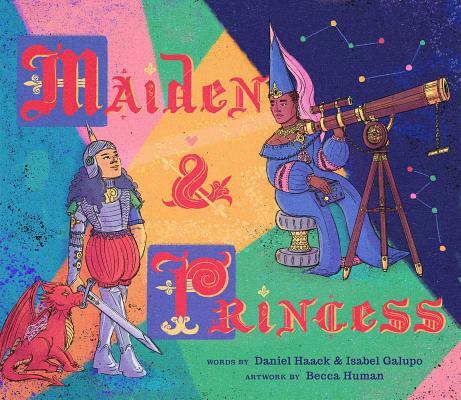 Daniel Haack is an Emmy Award winner who made his children's book debut with Prince & Knight. He loves writing stories that are filled with action and adventure (and okay, maybe a little bit of romance, too). He graduated from Ithaca College as a Park Scholar and is a Saul Zaentz Fellow at the Harvard Graduate School of Education. A former Wisconsin farm boy, Daniel currently splits his time between Los Angeles and Boston. Find out more at danielhaack.com. Isabel Galupo lives and works in Los Angeles. She graduated from Ithaca College as a Park Scholar with a BS in screenwriting and also participated in the Lambda Literary Writers Retreat for Emerging LGBTQ Voices. When not writing, Isabel FaceTimes with her four younger sisters and daydreams about the fat, squishy pug that she will one day adopt. Visit isabelgalupo.com to learn more. Becca Human is an artist and filmmaker living and working in London, England. Their colorful illustrations, comics, and films fluctuate between narrative and abstract, and are often driven by themes of futurism, isolation, and surrealism. You can find their work at beccahuman.com. There is wonderful diversity in the colorful illustrations-the royal family is Black, the visiting princesses come from multicultural backgrounds, and a range of body types are represented. . . . Share widely this sweet, openhearted fairy-tale that gently affirms all kinds of love.